"Wonderful article John ~ thank you! I was so glad to see that you suggested drizzling it onto cooked vegetables as I..."
How Can Coconut Oil Make You Feel Great? Fronds of a coconut palm sway in a tropical breeze, surrounded by endless sandy beaches, summer sun, and the turqouise horizon of crystal clear ocean. Stress and deadlines melt away in the cool shade, restoring your body. A sip of a pina colada recalls a recent pleasant gathering with your friends. You breathe a bit more easily. The coconut is a delight for the senses and the body, the very symbol of tropical paradise. This idyllic and fun tree nut restores your balance and harmony. Among oils it is light and sweet to cook with, soothing to the skin and nerves, nourishing while stimulating energy. You can also lather it on for smooth, supple skin. Are you overly nervous and strung out? Your nerves may be parched for fats. All nerves are coated in a fatty layer called the myelin sheath, which guides nerve impulses and insulates the neuron from hyperactivity. When the fatty layer is dried out or deficient, your nerves will be easily agitated and anxious, thirsting for a balm that can ease this overstimulation. A teaspoon of coconut oil restores tranquility, bringing the serenity of the tropics closer to home. With its unctuous silkiness and rich enticing aroma, coconut oil may be the ultimate 'neuron' comfort food, with a satisfaction that is 'marrow deep'. While most nourishing, oily foods depress metabolism, coconut oil is unusual in its ability to support the thyroid and improve metabolism. Coconut oil contains healthy fats and fatty acids that are quickly and easily absorbed, digested, metabolized and utilized by your body, ideal for nourishing the elderly and those debilitated from disease. Coconut's stimulating richness restores your vigor and vitality with a nutty aroma that gratifies the senses, a nourishing alternative to coffee that treats the root cause of exhaustion without the jitters of caffeine. Try supplementing your diet with coconut oil daily to boost your energy efficiently and effectively! Coconut oil has a luxuriant richness that feeds you and your liver. Ayurveda suggests that an agitated liver should be moistened with fats, and pleased by sweet, delightful aromas like rose petals and coconut. By nature an ambitious organ, the liver falls victim to intense, hot blooded emotions and pitta internal heat conditions. Coconut oil replenishes a liver deficient in fats, and has special cooling properties to soothe an overheated liver. Coconut oil protects the liver from damage done through alcohol. It is one of the best Pitta pacifying oils for Ayurvedic massage. Coconut oil cools and eases the tension accompanying liver overactivity, restoring grace and kindness. Your relationships will benefit from your new, more yielding & charitable disposition. Looking for supple, younger looking skin? Coconut oil is not only getting a medical makeover, it will give you one too. Your body will drink this beauty oil up! It will protect your skin, help you retain a balanced level of moisture, and heals dry or damaged skin - all without leaving an oily messy feeling. According to Ayurveda, coconut oil cools excess heat in the skin, and helps alleviate discomfort caused by eczema, dry psoriasis, sunburn, and general dryness. 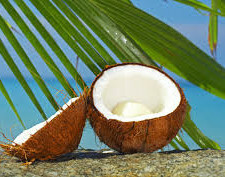 Heavenly coconut oil has been used as an effective sunscreen for thousands of years by indigenous, pacific islanders. Give it a try. You will soon enjoy the benefits of this healthful and anti-aging oil and your skin will look and feel younger, smoother and more radiant. This vital oil, once shunned as being unhealthy because it is high in saturated fats, is now considered by many as a magical health food. The difference between coconut oil and other saturated fats is in the size of the fat molecules. Long chain fats are hard to digest, and pass directly into the lymphatic system. The fats in coconut are medium chain fatty acids (MFCA's). These MFCA's are quickly digested, even without the aid of pancreatic enzymes, and are transported via the hepatic portal vein to the liver. MFCA's never enter the lymphatic system or blood stream, so they don't clog arteries like their longer chained relatives. Instead, they are light, easy to digest, and quickly converted to energy. Coconut oil actually lowers cholesterol and improves fat metabolism. Overweight folks can use it to metabolize the fat they already have. Underweight people can use it to restore body fat. Athletes can use it for endurance and performance. Debilitated people can use it to build strength. Coconut oil also improves your body's ability to utilize blood sugar efficiently, which reduces the symptoms of hypoglycemia. Coconut oil contains high levels of a fatty acid called lauric acid, an anti-viral substance. Coconut oil has also been shown in research studies to have anti-microbial qualities, which have an adverse effect on fungus, bacteria, and yeast. Coconut oil also appears to have a natural anti-inflammatory effect, which ultimately supports your immune system. The tender coconut with its light, sweet and cooling properties is hailed as a "cure all" enjoyed by many cultures as a staple part of their diets. The ancient Ayurvedic texts call coconut by the Sanskrit term "kalpa vriksha," which translates to "the tree that supplies all that is needed to live." Pacific Islanders consider the coconut the "cure for all illness." These magnificent statements have validated themselves over thousands of years of beneficial use. For optimum results use extra virgin coconut oil that is unrefined. Look for these qualities when shopping for coconut oil: In solid form, it should glimmer with a white opaqueness, and when liquid should be colorless and crystal clear. When you use it (whether for your body, taken as a supplement or cooking with) the texture of coconut oil should feel thin, light and silky. The aroma and flavor should be inviting and fresh. Browse Recipes Coconut oil has a lower oxidation point therefore it won't become rancid quickly, compared with other oils. It's time to stock you pantry up with this tropical nectar. Being a stable oil with a shelf life of at least two years, coconut oil is extremely versatile. Coconut oil is ideal for lighter foods & subtly flavored dishes. It may be mixed into a salad dressing paired with lime juice. It can be safely heated to high temperatures, so enjoy the sound of sizzling coconut oil as you fry okra, pumpkin without the risk of trans-fats or free radicals. Even after cooking, you will taste the enriching natural coconut flavor throughout your entire dish - simply delicious and nutritious! Drizzle into soups or onto par boiled vegetables. Rice embellished with a tablespoon of coconut oil will have a delightful aroma. Its sweet and nutty flavor is perfect for desserts and treats, such as smoothies. Coconut oil is excellent for melt in your mouth popcorn. Use an alternative to butter in baking, where it makes a light and flaky crust. Is Coconut Oil Good for Me? Find out by taking this free, easy quiz. You'll learn your body type, and whether Coconut Oil is a good fit for you. Time to complete: approximately 1 minute. Coconut Oil is recommended for Autumn-Winter. Check out these other Autumn-Winter foods here. Do you like 'coconut oil'? Why or why not? What makes it unique? Is there something you'd like to know about 'coconut oil'? A refridgerant is a product or formula with cooling qualities for the body. Read further on this page and note the section "Cools Overheated Skin". I have heard that for oil pulling you should not swallow because you don't want to swallow all of the bacteria you just pulled out of your teeth.